Today, September 9, is the 90th birthday of my first cousin twice removed Elise Lemore Thompson Stroud. She is the oldest daughter of a younger sister (Euna Ann Shelton Thompson, 1905-1959) of my great-grandmother Addilee Tennessee Shelton Wolfe Odom Harris (1890-1977). By 1935, Addilee and her third husband, Charles Burroughs Harris (1887-1959), had moved back to Louisiana from Texas. 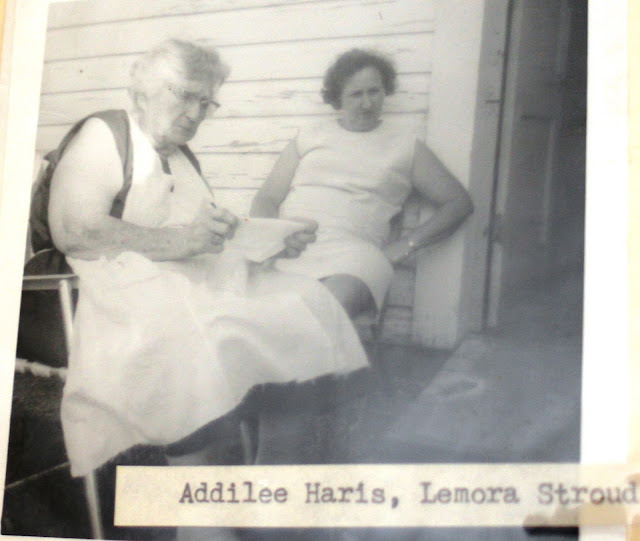 Charles and Euna both died in 1959, within two weeks of each other, and Addilee and Lemora became close, as evidenced by this photograph, in an album owned by my first cousin twice removed Shirley Thompson, Lemora's youngest sister, which I got to see at a Shelton family reunion in June 2016. The photo above is probably from sometime in the 1960s.